If you’re lucky enough to own an XTR Shadow Plus rear mech, but unlucky enough to smash it to pieces (like our technical editor PB) then you should definitely watch this. Although spare parts for this mech aren’t cheap, if you’ve broken the inner and outer plates which form the cage, for example, then you’re looking at less than half the price of a new unit to replace. The bracket axle unit (B-axle), which can also become bent in a crash, costs £35, so even if you’ve mangled the bracket, snapped the cage and lost both jockey wheels in the bushes, you can save some cash by taking on the repair job. First, though, make sure the parallelogram of the mech itself is straight — otherwise you’ll be wasting your time and money. Check that whatever is left of the cage stays parallel with the top of the mech (where the B-axle attaches) through the mech’s range (pull it by hand) and look for any stress fractures (cracks and funny marks). If any are present, or it’s bent, then it’s only really fit for the bin. Here we show you how to replace these broken bits in simple steps with a minimal array of tools. This guide is also useful for changing cage lengths if swapping from a triple chainring set up to a double and bash or 1×10. To obtain parts check for your mech’s model number on the back of the mech, click here and find the exploded view of your unit. Jot down the part numbers and head to a decent bike shop to get the bits ordered. 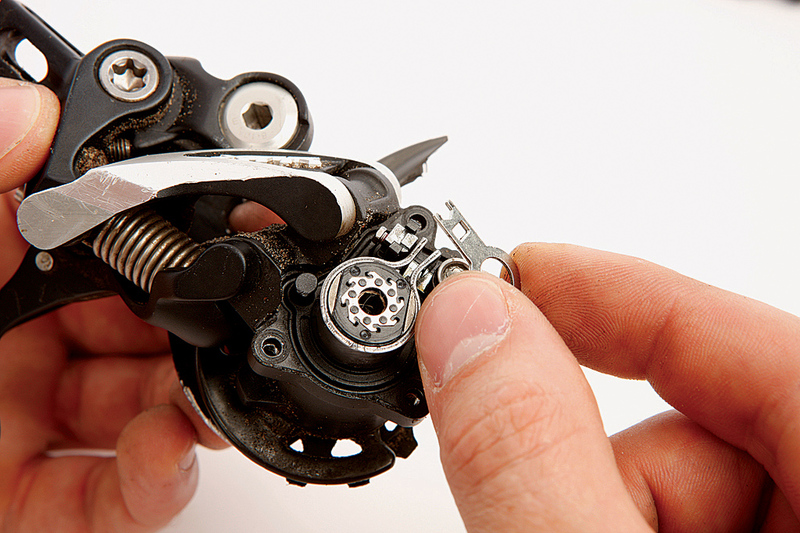 The full article on repairing a Shimano XTR rear mech appears in the October issue of MBR, on sale from Wednesday 19 September.